My triceps hated me this morning. Doing tricep push ups right after tricep pull-downs was killer! Follow the push ups with tricep kickbacks and I was definitely feeling the burn. Something I find kind of odd is that fact that I like feeling the burn during upper body workouts, but feeling the burn during lower body workouts makes me feel way more fatigued. I can quickly bounce back from upper body burn whereas I require much more recovery time with lower body burn. The glutes, quads and hamstrings are much bigger muscles than dinky lil’ triceps and biceps though, so I guess this makes sense. After a few days in a row of sweet breakfasts, I was ready for a savory breakfast. 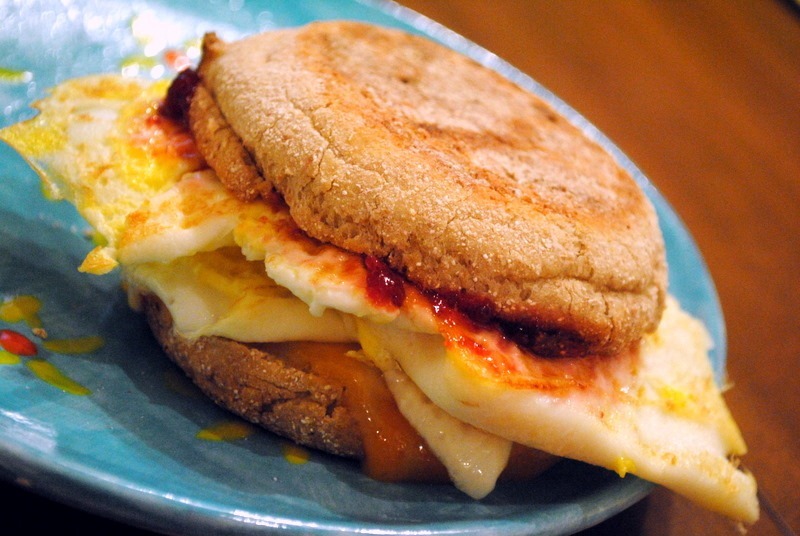 I ate an egg sandwich made with two fried eggs, Colby jack cheese, raspberry jelly and a toasted Publix honey wheat English muffin. Do you prefer upper body or lower body strength workouts? I definitely prefer upper body workouts and love working out my shoulders. My favorite, by far! I did an Arm Pyramid this morning after HIIT and my arms were so tired I could barely blow dry my hair at the gym. Love it! For my part, my legs are killing me this morning. I barely even slept because I feel so stiff from yesterday workout… But I love it! I love when I feel my muscles, it means that I did something right. And I don’t care if it’s legs or arms, I like to do both. I never thought about it, but lower body workouts fatigue me much more than upper body, too! I like lower body workouts, because my upper body isn’t very strong and I get frustrated! Which is why I should do more upper body workouts. Definitely prefer the upper body burn. The lower fatigues me way more, too. Do you and Ryan do your strength training together or separate? I think I might do it more if I could get my fiancé on board with a buddy system. My upper body is so weak compared to my lower body. I agree it’s easy to recover from upper body workouts. Sometimes I’ll work my legs so hard that I can’t even workout the next day. I go back and forth….sometimes I prefer upper body, sometimes I prefer lower body. It’s weird, sometimes I just really need to get energy out of my upper body. Like if I’ve been stressed, I feel like I have to do something upper body! I tend to hold stress and tension in my upper back, shoulder and neck, so on those days, it’s an upper. On days other days I lean more toward lower body. Probably because I’m most familiar with it. I hate LUNGES and those tiny bodypump pulsing lunges. I definitely prefer upper body! I did one of your workouts recently and it was awesome! I also started doing 8 minute legs at the suggestion of my sisters and am loving that – it’s low impact but you can definitely feel the burn! Lower body! Only b/c I have noodle arms and have NO upper strength (which I would have If I worked on them more) LOL! just curious, do you use organic eggs or regular eggs with your breakfast sandwiches? I love upper body work outs so much more then lower body! Leg work outs just take it out of me so much more then arms! Side note I have been thinking of trying your egg and jelly combo (not a huge cheese fan) and I finally bought Chia seeds loving over night oats right now! I love working out my upper body so much more than my lower body. Plus if I get my lower body sore than that’ll mess up my training for my race ha! I do total body exercises, 3 days a week. I can only get to the gym 4 days a week, so the total body is every other day. The off day, I do strictly cardio, and some planks. You’ve inspired my lunch choice. I prefer supersetting exercises, but if I had to choose one, I’d say upper body. Do you have a link to more detailed descriptions of each of your arm workouts? I’ve just started training for yet another marathon, and while it won’t necessarily do me much good for running, I want to utilize my “rest days” by doing some arm toning at home. I prefer upper body! Arms and abs are my favorite. My knees are trashed though so most of the time I’m afraid of injuring them again so I baby my lower body. I like doing lower body more, but I like the way my upper body looks when I do it. Weird? I am with you girl! Lower body workouts always leave me feeling exhausted, while upper body workouts make me feel buff! 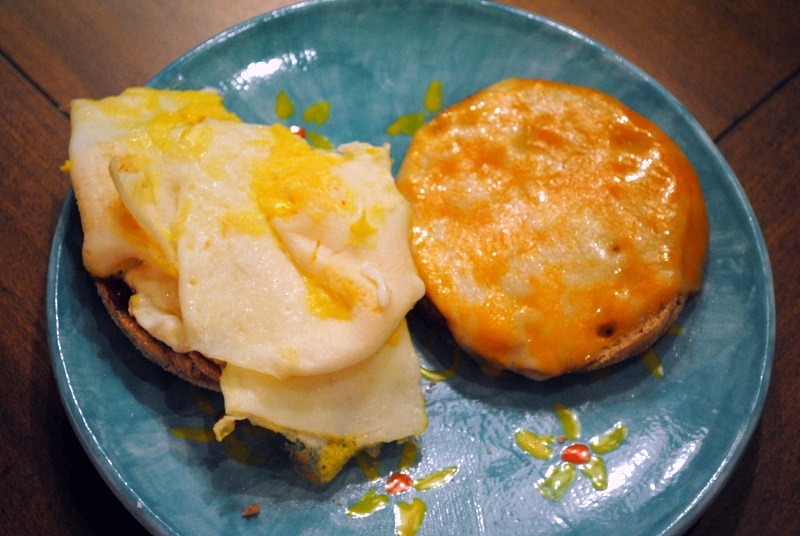 Your egg sandwiches always look so stinkin’ good!! I totally know what you mean about upper body routines! I enjoy that burn too, and it’s just so much fun to work them out. I think tricep is one of my fave parts to focus on because it can be so challenging. I don’t think I could pick between liking upper or lower body strength training more. I have a lot harder time going all the way with upper body things…like if I’m doing overhead shoulder presses, by rep 10 (especially if I’m just moving up to a heavier weight) I’m usually lucky if I can extend my arms more than 45 degrees. I feel a lot more accomplished after those ones, but lower body ones are a little easier for me to do several sets of, so I kind of like them a lot as well. Though sometimes my knees get twingy after too many lunges or squats, and that’s no bueno. I really just love strength training in general haha. I love doing arm exercises because you can actually see when you have improvement! While I’m a cardio queen, when I do strength training I definitely prefer to work my arms. And it was way easier to recover from arm workouts because I use my legs a lot more. You can get up and move if just your arms are sore, but if your legs are sore, it’s much harder to do things! I am always targeting lower body, def. have to work on making upper body a priority. 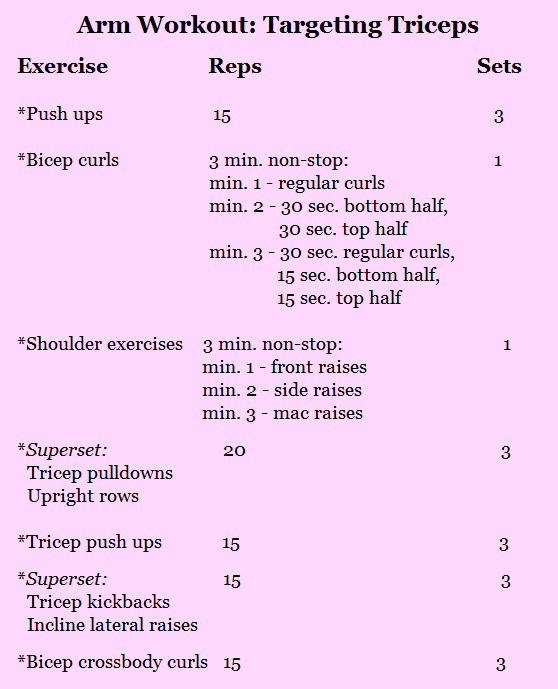 thanks for posting such an awesome upper body tricep workout! Tricep pushups are crazy.. i cannot! I love the feeling I get after a good legs day, but I definitely love upper body workouts more 🙂 I feel like I recover better as well, and can push myself easier! 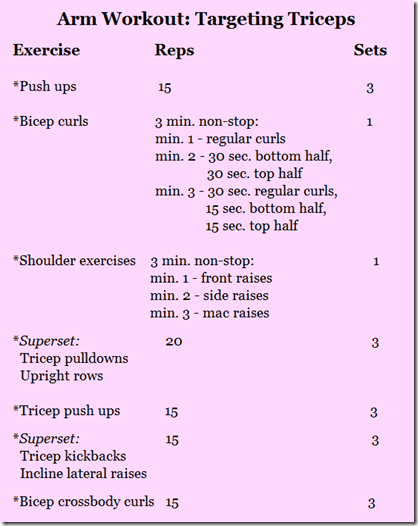 This looks like a fun workout…its hard to get Tris. Can’t wait to try it. Thanks. I actually like working my lower body better but for whatever reason my body responds so much better to upper body workouts. I could probably do squats for days with no change in muscle definition but do one set of pushups and my guns are rockin’ 🙂 Funny story – when I was in high school my dad and I were at the gym and he said “I’m going to give you some advice for the rest of your life – always focus on your triceps so you don’t have that waggly turkey arm some ladies get.” That was over 10 years ago and I still think about that every time I work my triceps. And thanks to him, my triceps are awesome. Definitely my favorite (and most developed) arm muscle. I love your blog and all your Sadie pictures! I know that you sometimes give her chicken jerky, and you may have already heard that some of the jerky was making dogs sick, but I saw this on the news and thought I would pass it on! Just as a pre-caution! Sorry I meant to post this on today’s post…oops!